Click on hand to order novels. This photo was taken at dawn on August 27, 2015 from the street in front of Blooming Rose Press by Lily G. Stephen. Please note: Last updated January 12, 2018. 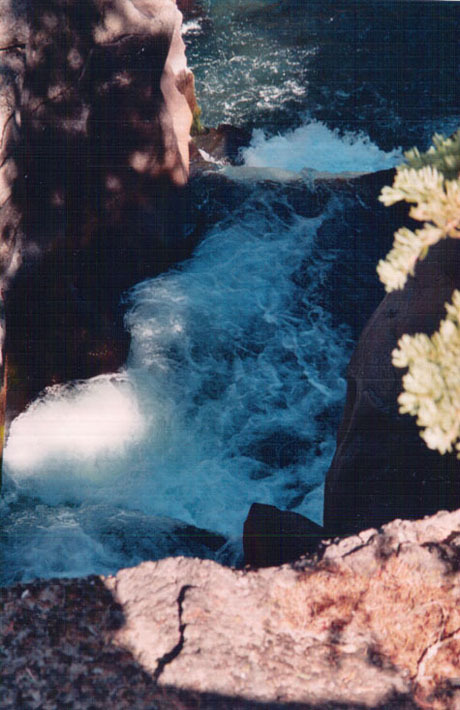 Page Two of this gallery features photos of Mount Shasta by the late Robert Bedford and is available through a link that appears at the bottom of this page as well as following this text. Be sure to check in often. These gallery pages are a work in progress. 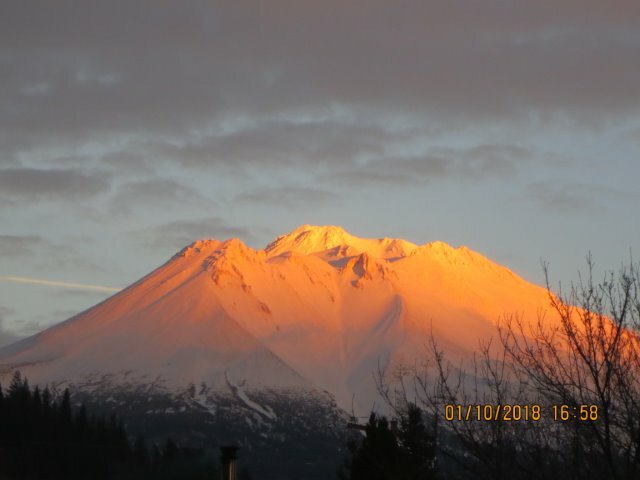 If you have a photograph of Mount Shasta you would like to submit, just contact us. If you are interested in the more personal aspects of events surrounding our evolutionary novels, view our separate Blooming Rose Press author gallery. Learn about our regional history resource, Mt. Shasta Sisson Museum. Click here for page two of our gallery. 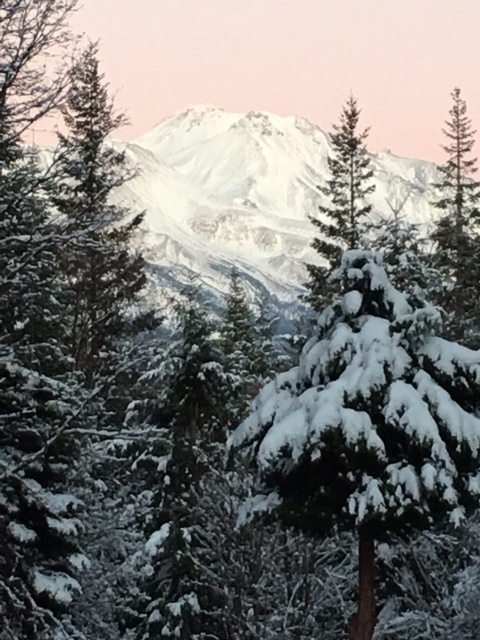 Here are two views of Mount Shasta taken November, 2015 by Vicki Brenner that give hope to all for an early snow pack! 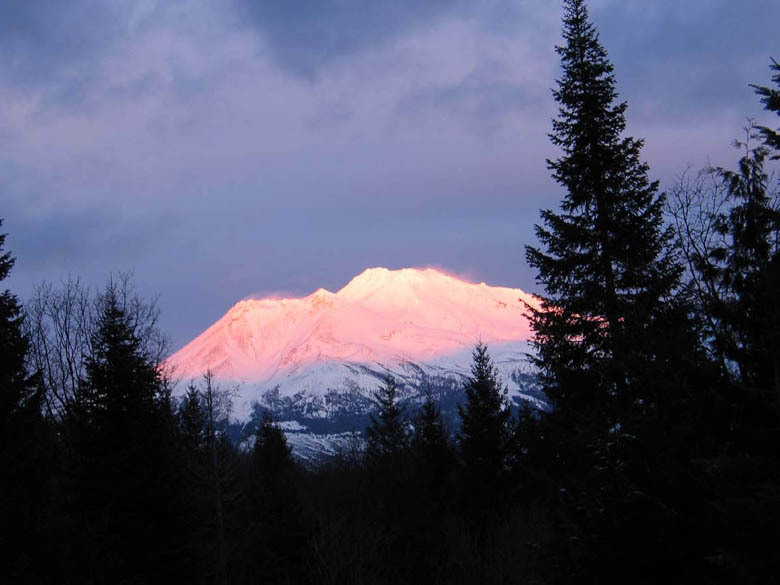 Mount Shasta at sunset, February, 2004. Photographer: Vicki Brenner. 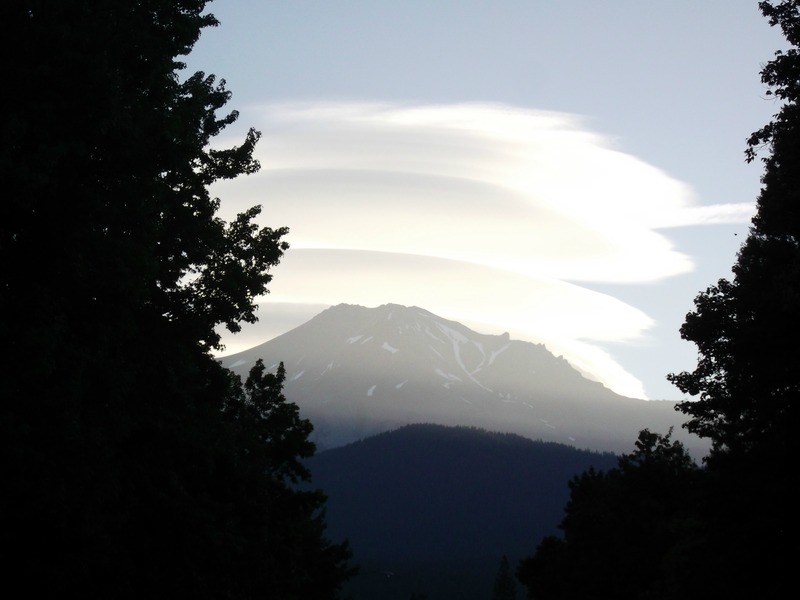 A frequently-asked question: Is Mount Shasta one of the world's Seven Sacred Mountains? 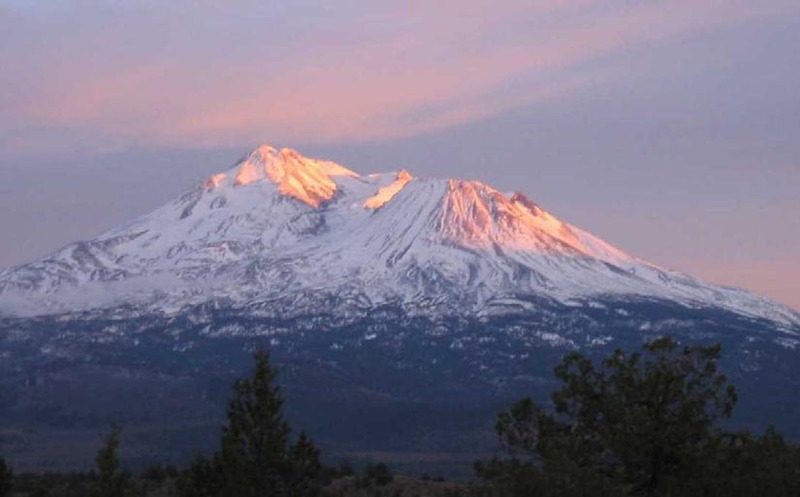 Good information can be found on the Mount Shasta Fact Sheet published and copyrighted by College of the Siskiyous, and written by William Miesse, historian and author. 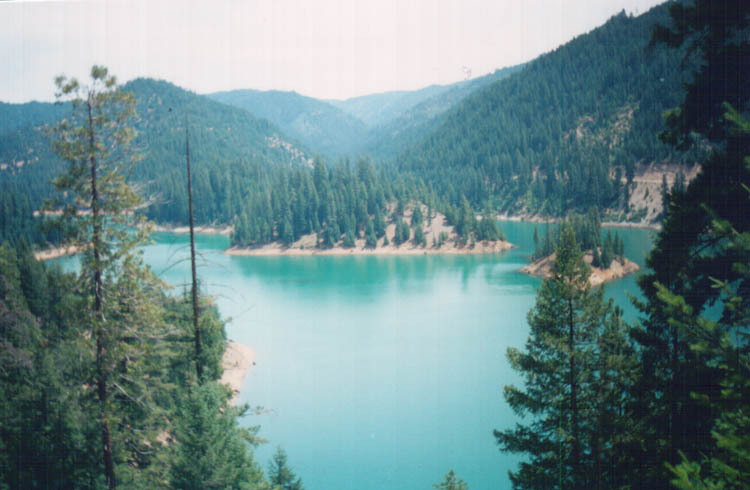 "...there is no officially recognized world list of seven sacred mountains and regional lists of sacred mountains (of the Navajo people or of China, for example) do not include Shasta. 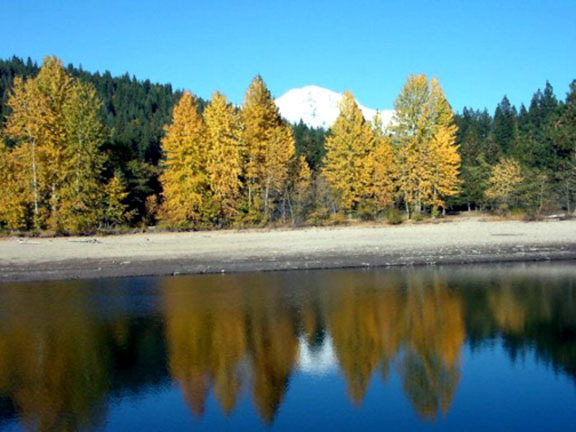 Nonetheless Shasta as a sacred mountain does have a well established and widespread legacy. To generations of Native Americans the mountain was and is a highly important place of reverence and a place of balance between earth and universe. To early Californian explorers, climbers, and settlers it was a source of awe and inspiration. To travel writers of the late 1800's it was "The Keystone of California Scenery" and "California's Fuji-san." 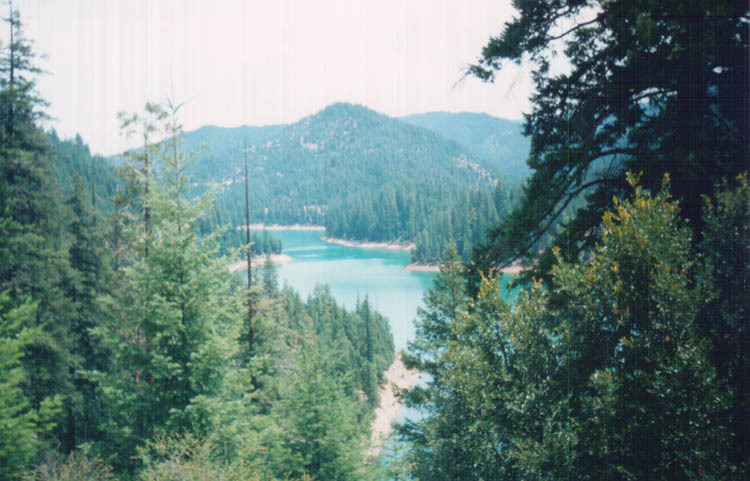 But it was in the early 20th century that three books firmly established Shasta's reputation as a most unusual and sacred mountain. These three books, A Dweller on Two Planets, Lemuria, and Unveiled Mysteries gave Shasta a body of myth and legend that is perhaps unrivaled in all of North American mountain literature." Mount Shasta at sunset, taken from Rancho Hills at Lake Shastina, November, 2003. Photographer: Chuck Frumerie. 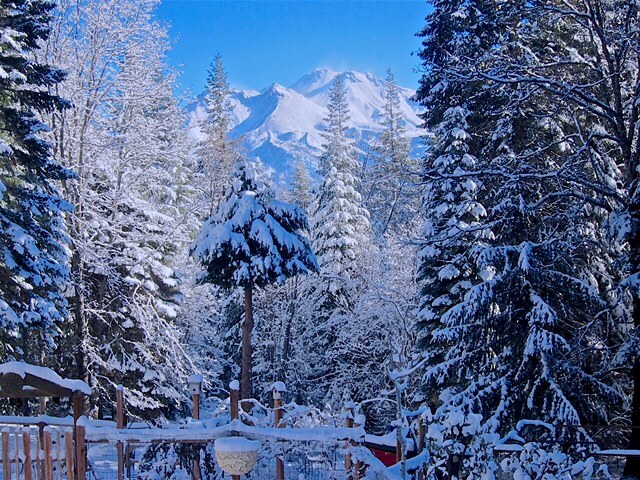 Our small town's milieu is presided over by Mount Shasta, known throughout the world as a source of legends and myths, and also as a renowned alpine experience. Couloir Backcountry Adventure, a prestigious magazine for serious mountain sports enthusiasts, calls Mount Shasta one of the "7 ultimate back country destinations" and ranks the mountain with Europe's Haute Route and Peru's Cordillera Blanca as one of the five best mountains worldwide for skiing. Mount Shasta provides one of the stage settings for astounding developments in each novel that comprises The Third Verse Trilogy. Even for those not as adventurous - those who simply love the mountain's ever-changing pageantry of beauty and those who delight in photographing it - this place is incomparable as a paradisiacal living experience. 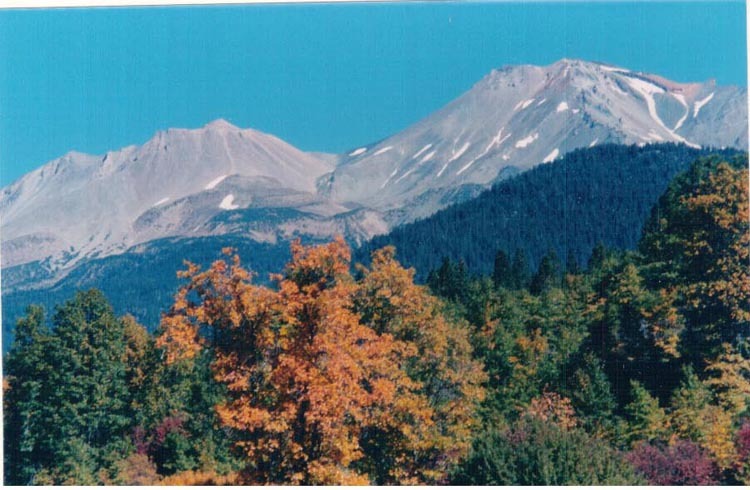 Access our Mount Shasta Information page for geological and volcanic resources, regularly updated, and also for an excerpt from (the late) Emilie A. Frank's book Mt. 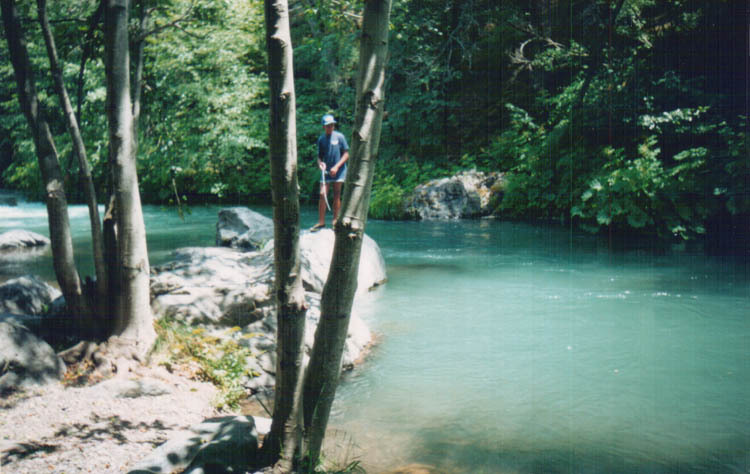 Shasta, California's Mystic Mountain, offering geological insights about the mountain. 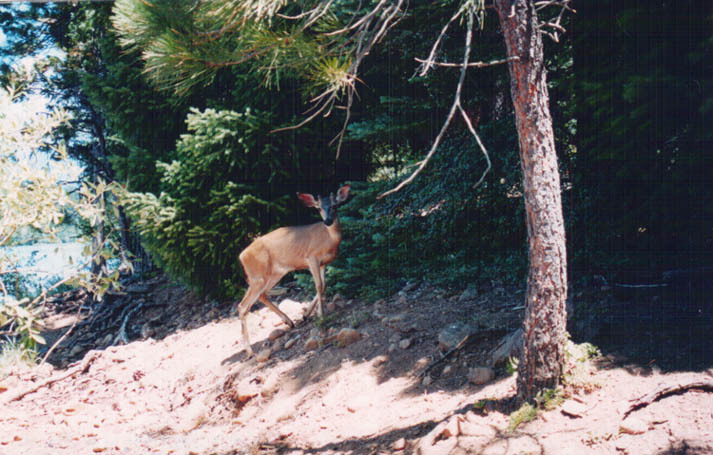 Here are a few photographs in which some of us share Mount Shasta's aspects with our visitors. Be assured, although these pictures may be impressive, seeing is believing. Of the hundreds of photos of this mountain that I've seen throughout 30 years, none fully captures the experience of standing on a typical street of our town and gazing at Cathedral Shasta. Also included are photographs of beautiful settings within the mountain's realm. These represent a small sample of high mountain lakes, meadows, forests, streams and waterfalls to be appreciated in the semi-wilderness country that surrounds us. Mount Shasta in autumn, taken from Shastice Park soccer field, October, 2003. Photographer: Lily G. Stephen. 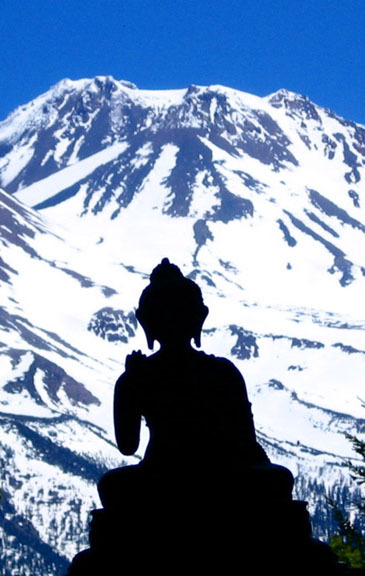 Mount Shasta, the Teacher. Undated. Photographer: Vicki Brenner. 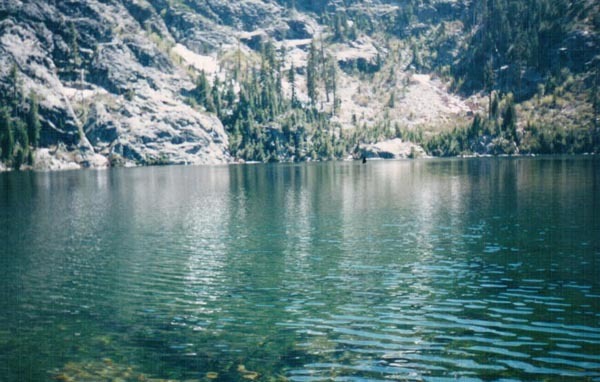 Castle Lake, spring-fed alpine lake. 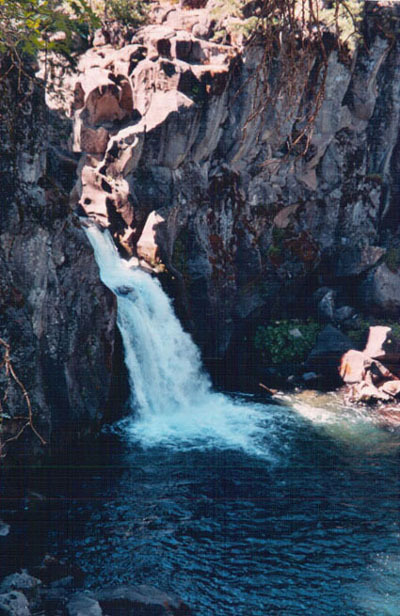 Taken from the north shore, late summer 2003. Cliff Lake, spring-fed alpine lake. Taken May, 1996. 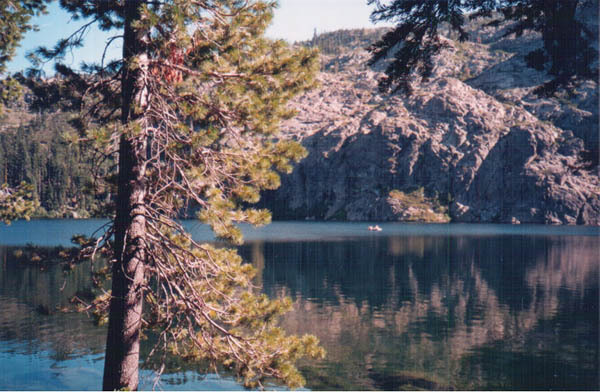 Another view of Cliff Lake, taken May, 1996. Photographer: Lily G. Stephen. 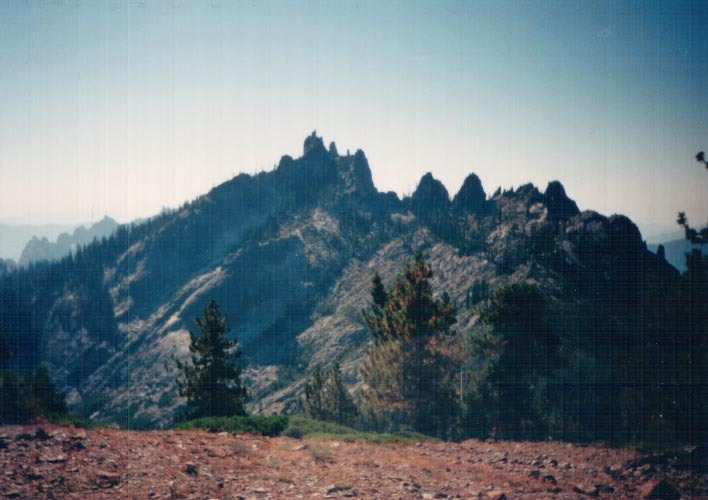 Approach to north end of Castle Crags. 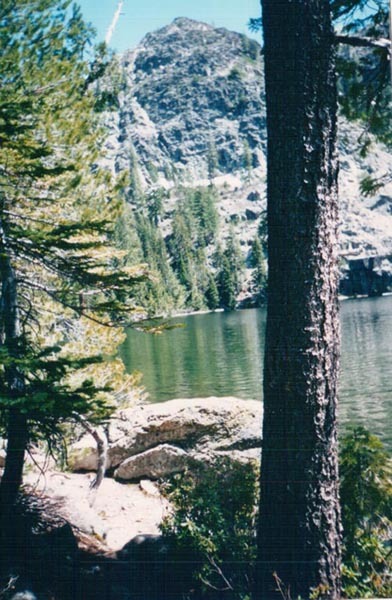 Six mile hike, point of origin Castle Lake, Heart Lake trail, then southward. 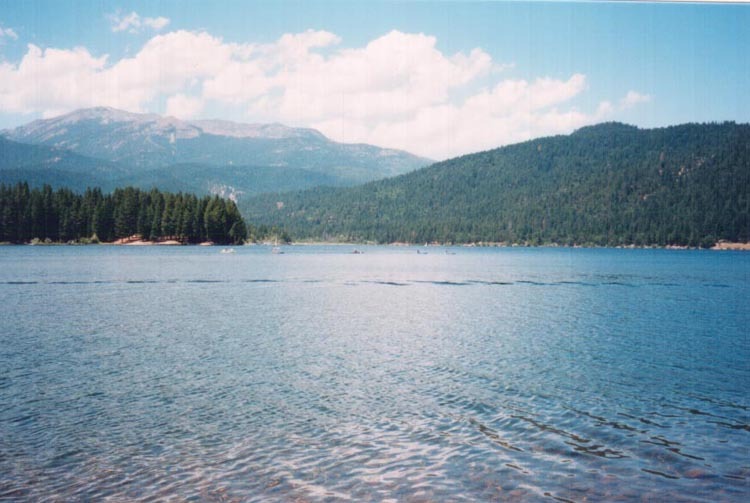 Another view of McCloud Reservoir, across from site of Hearst Estate, July, 1992. 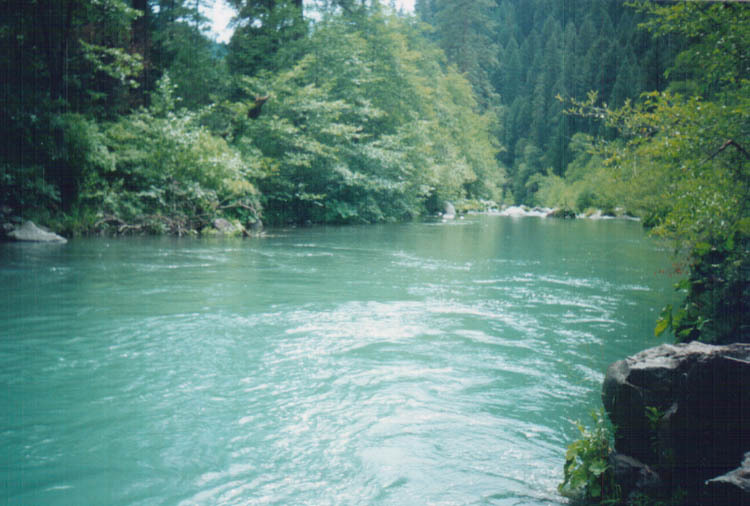 Fishing the lower McCloud River at AhDiNa. July, 1992. Photographer: Lily G. Stephen. Are you interested in AhDiNa's history? Our end-of-summer hike beginning at the Lower Falls on Lower McCloud River. 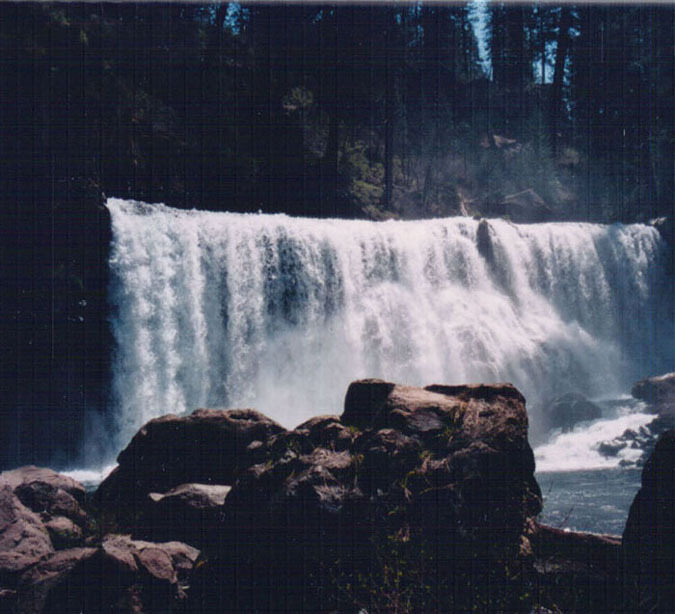 Lower McCloud River, Middle Falls. 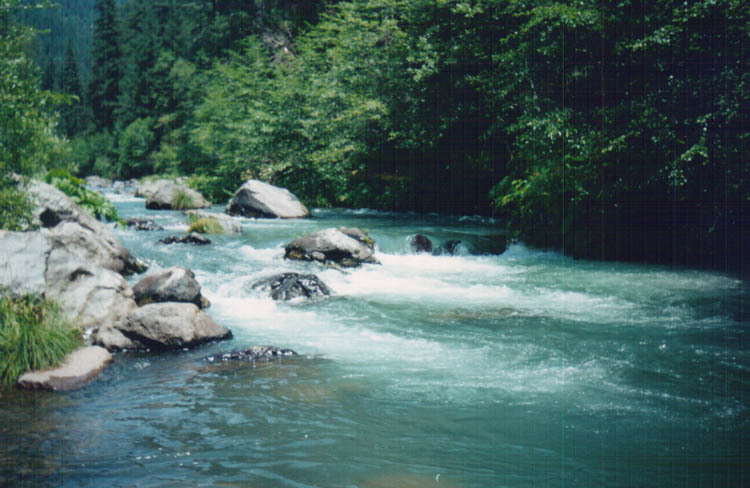 This view was taken during springtime when the flow was heavier and in direct sunlight. 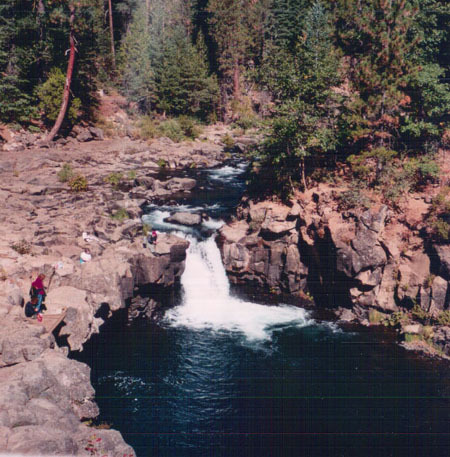 Lower McCloud River, above Upper Falls looking down on the cascade. 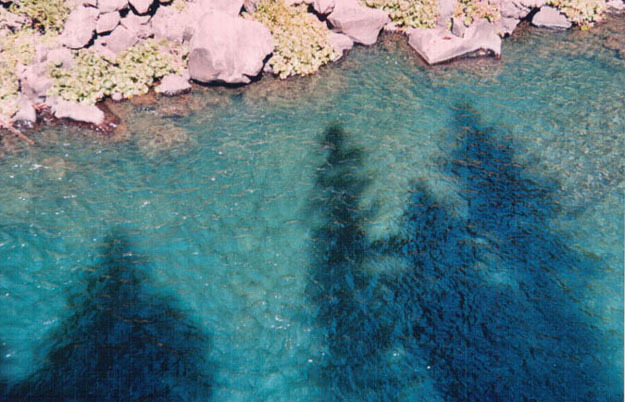 Lower McCloud River, enchanting view of the Upper Falls pool. September 21, 2004. Photographer: Lily G. Stephen. 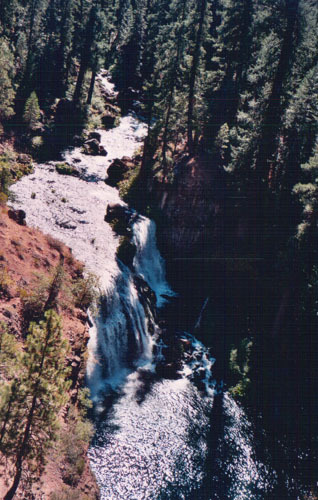 Next, Page Two of Blooming Rose Press's Mount Shasta photo gallery. All images and written/spoken material are protected under copyright by Blooming Rose Press. No material may be reproduced without written permission. Click on "Contact us" for permission.